American Cruise Lines is building four new riverboats for American river cruising. Construction has begun on the first two ships, with the first to begin cruising in in the spring of 2015. These first two vessels will carry between 150 and 200 guests and will cruise the Mississippi River system and the Columbia and Snake Rivers in America’s Pacific Northwest. The four new ships will enter service between 2015 and 2017. American Cruise Lines said they will include large staterooms, private balconies and spacious dining and lounge venues. At least one of the four new ships will operate cruises along the Columbia and Snake Rivers from the Pacific Coast to the Idaho border, more than 500 miles inland. It will be specially built for cruising in the Pacific Northwest with historic accents and modern conveniences. In addition, the art collection is being carefully selected to highlight the Lewis and Clark expedition and the Native American tribes who helped them. During the cruise, guests will learn about the Lewis and Clark expedition while enjoying the comforts of cruising. The itinerary will be similar to American Cruise Lines’ existing itinerary on the Columbia and Snake Rivers aboard Queen of the West, which was extensively renovated in 2010. In 2012, American Cruise Lines introduced Queen of the Mississippi (shown in the photo at left in New Orleans*) to the Mississippi River region. It was the first new ship on that river in nearly 20 years. The additional new ships will have many of the same features and carry approximately 150 to 200 guests. The line said they will have the largest staterooms ever with sliding glass doors for panoramic views, room service, and other amenities unique to American Cruise Lines. “There is a longstanding history of riverboating in America,” said Timothy Beebe, vice president of American Cruise Lines. “Since the 1800s, each new riverboat has sought to outdo the last by offering more amenities, comforts, and service than its predecessors." American Cruise Lines has experienced annual growth of more than 25% in each of the past three years. 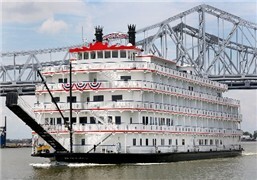 It operates riverboats and small cruise ships on more than 35 itineraries around the U.S. For more information, visit www.americancruiselines.com.